Lukas Foss (b.1922) used to be heard in UK regularly a few decades ago, but seems to have virtually disappeared this side of the Atlantic. Still alive, this is a very welcome reminder of an urbane, greatly accomplished composer, whose piano music is original and personal despite being broadly tonal (he flirts with minimalism in the 1981 Solo, but not oppressively). 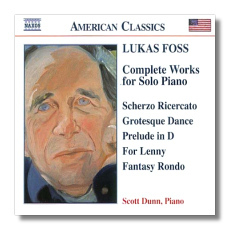 Bach is behind a lot of his methods, Bartók too, sometimes Hindemith; but Foss is his own man, and he has a fine devotee in Scott Dunn in this tribute CD. Received alongside two releases of music by the more flamboyant Henry Cowell, this addition to the Naxos American Classics Series is equally recommendable. Everyone who likes 'middle of the road' 20th Century music should enjoy it.